This is intended to serve as a working code example for developers. It is of no use to end users. It is not supported by Palm in any way. It is not complete. Above all, the code strives to be simple at the expense of end-user beauty. I found myself spending more time trying to divine the meaning of the API than actually coding. Since I couldn't find any good examples, I decided to create my own. 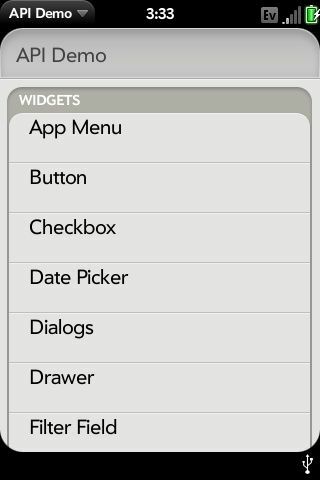 This currently demonstrates most widgets, orientation events, location one-shots and subscriptions. View the source in the .ipk package itself or ask for SVN access as described below. If you find yourself wanting to write test code for some API function that is not in this app, please consider adding it to this app and sending a patch to the email address in the About dialog. State "I donate this patch without restriction" in your email. State your name so that you can be credited.